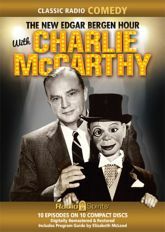 Twenty years after they first convulsed the nation over the air, Edgar Bergen and Charlie McCarthy were still going strong -- in a slick, entertaining full-hour series featuring an array of interesting and unusual guests! Please note: This CD-R product is manufactured on demand using CD-R recordable media. This allows us to make a wider range of series and episodes available.